Good news! The Nintendo Switch gets its own version of Minecraft today, and it’s good. In fact, it’s made me want to play Minecraft more than I have in a long time. Minecraft: Nintendo Switch Edition comes out this afternoon on the Nintendo eShop, with a physical version coming “at a later date.” Nintendo sent us codes a couple days ago, and I’ve played a few hours of the game. I’ve had a great time. I mean, of course I have! It’s Minecraft. 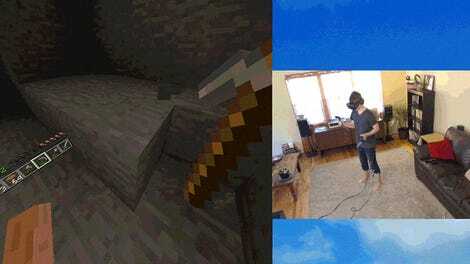 I like Minecraft on PC, on consoles, and even in virtual reality. It feels particularly at home on the Switch, however, and I can actually see myself playing more of this version than I have since I first bought the game on PC all those years ago. For the most part, this version of Minecraft isn’t particularly different from other console versions of the game. It runs at 60fps docked and undocked, and both versions look crisp and play well. The draw distance is noticeably longer when docked, but only if you put screenshots of the two versions side by side. This GIF compresses the image quality, but should give you a sense of the draw distance. It supports online play for up to eight players, and split-screen local play for up to four. It comes with the standard survival mode as well as creative mode, which lets you freely build things without worrying about getting it blown up by a creeper, and minigames like battle mode, where players duke it out for bragging rights. Like the Wii U version, the Switch version comes with a Mario texture pack, as well as a bunch of Mario character skins. 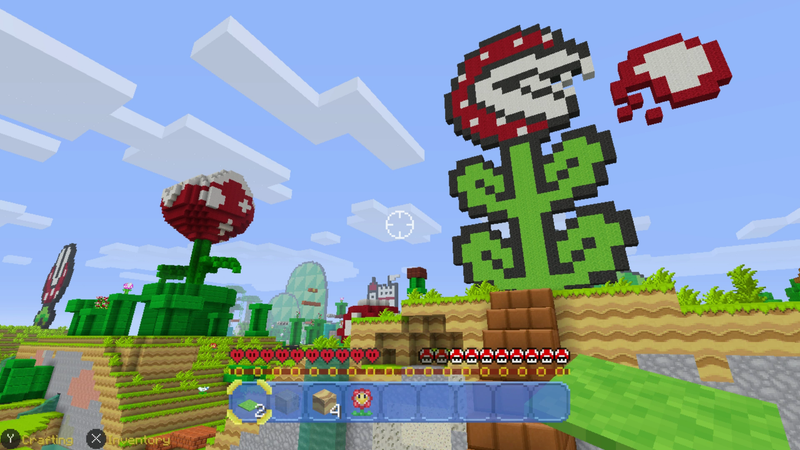 There’s also a pretty cool pre-made Mario-themed world you can load up, which you can see in the screenshots up top. Above: Daisy and Rosalina prepare to settle this thing once and for all. Minecraft has always been a lot of fun in multiplayer, and I love the idea of local Minecraft co-op in particular. (I remember writing this article about how much I liked concept waaaaaaay back when the idea of playing Minecraft on a game console was novel.) Switch split-screen works fine both docked and undocked, at least with two players. I was able to pop the Switch out of its dock and my two-player split-screen game kept going at what looked like a solid 60fps. Online multiplayer is no-frills but functional, at least as far as I’ve tested. I invited my colleague Eric Van Allen into my game, by which I mean I sent him a DM using our work chat and asked him to join. As far as I can see, there’s no way to invite someone to your game using the actual game interface—you simply see which of your friends are actively in a game and decide if you want to join them. Eric picked my game from under the “Join” tab in the main menu and voila! We were playing Minecraft together. There’s no built-in voice or text chat, or even any sort of emote system, so you’ll have to coordinate communication using an outside chat or voice service. This version of Minecraft also doesn’t take advantage of some of the Switch’s other features: Each player needs a full controller, so you can’t play the game in split-screen with individual joy-con controllers, nor is there any touch screen functionality when in handheld mode. Those things haven’t bothered me much, though I am concerned about the lack of cloud saves and the Switch’s continued lack of way to backup your saved games. Bad enough that I might lose my Zelda save if I break or lose my Switch, now I’ll also lose all my new Minecraft creations! The more games the Switch gets, the more urgently Nintendo needs to add some sort of backup functionality. Let’s put all of those bullet points and feature comparisons down for a minute, though. I really like playing Minecraft on Switch. In fact, I can easily see it becoming one of my most-played Switch games. It’s fine on the big screen, and easier to play split-screen that way. That’s nothing I haven’t seen before. But this game is also fantastic on the go, and the Switch does on-the-go Minecraft better than I’ve ever seen. Tablet and phone versions don’t control in a way I like, unless I want to bring along an external game controller. The Vita version is fine, but doesn’t run all that well. The Switch version finally hits a sweet spot between performance, ease of use, and controls. It also looks terrific on the Switch’s screen. The fact that you can play split-screen with a friend on the go is just a bonus. My current house isn’t as cool as anything in that massive Mario world, but whatever, it’s mine and I love it. 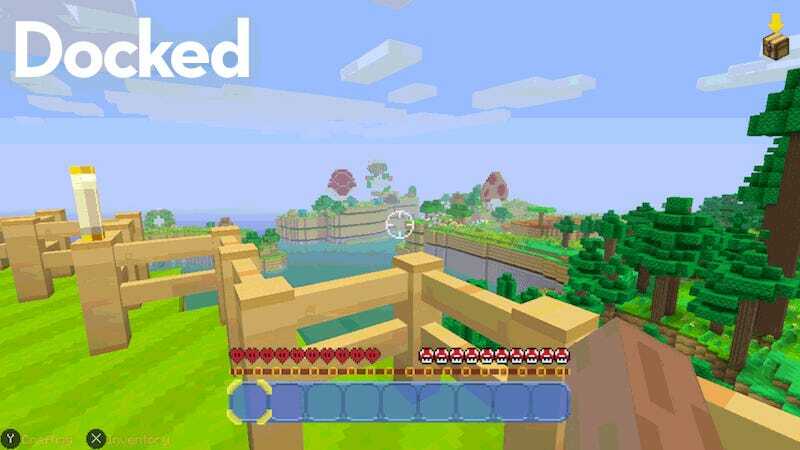 The Wii U got Minecraft too late. It was such an obvious fit for the console, but by the time a port arrived in late 2015, the Wii U was already on life support. Mojang apparently decided not to make the same mistake with the Switch, and I’m glad for it. All they really needed to do here was put a good version of Minecraft on the Switch, and that’s what they’ve done. It’s a great game, made much better by the Switch’s portability. For the first time in years, I think I’m going to actually sink some time into Minecraft again.